For those looking for both size saving and capability in a small pickup, look no further than the 2017 Toyota Tacoma. It is ready for anything that the road throws at it, from dirt trails to the open highway. It is ready to drive you across the country, or just down the street from the store. Toyota has pushed further with the 2017 Tacoma and the moment you sit behind the wheel. Though the small pickup class is highly competitive, you can’t get much better than the Toyota Tacoma. It was made for real life. With such a wide selection of great small pickup trucks on the market today, it might seem daunting to compare them and make a decision. So let’s compare it to three of it’s competitors, the durable 2017 Nissan Frontier, the versatile 2017 Chevrolet Colorado and the comfortable GMC Canyon. Every single one of the Toyota Tacoma’s competitors keeps the small/midsize pickup truck class on its toes. This fiery competition makes every single truck better, as the manufacturers have to work harder to keep up. When one truck jumps higher in an area, the rest push to surpass the new standard. Isn’t that exactly what you want to see in competition? A close race? It gives the audience, or in this case the buyer, a better finale. Both the 2017 GMC Canyon and the 2017 Chevrolet Colorado, which are very similar trucks, give great horsepower and torque, with a lower annual cost of driving. While the 2017 Nissan frontier, shows its power with its towing capacity at a affordable price point. Each of the small pickups has its pros and cons and the categories in which it truly outshines its competition. You won’t be able to truly see the difference until you visit a dealership and sit behind the wheel. At McPhillips Toyota, we are always excited to get you into a new 2017 Tacoma to test drive. We’re always here to answer all your questions too, so contact us today. As you can see from the table above the four trucks are fiercely competitive with each other, each pushing their horsepower, price-point, towing capacity, payload and fuel-efficiency to new levels. Their individual fuel-efficiencies differ by a mere 1.3L/100km for the highway. Standard I-4 DOHC engines on each base model give way to their respective V6 engines on the higher trims. The Tacoma V6 limited edition has an impressive top horsepower of 278. So where does the Tacoma truly rise above this difficult competition? Well for starters the 2017 Tacoma has won its division for the Canadian Black Book Retained Value award. This is one of the most important things to look at when purchasing a vehicle. Depreciation is huge, especially when you go to sell your vehicle in the future. With its best in class retained value you know that it’s slightly higher price point is worth the value you get. Toyota’s have always been known for their value retention! 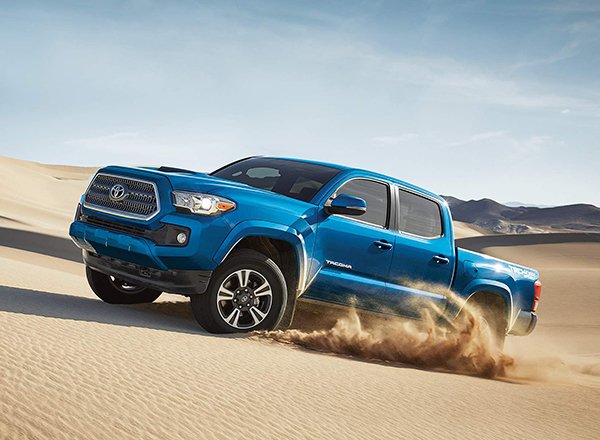 Compared to its three competitors, the Tacoma sweeps them away with its payload. With 680kg, you can put so much into the bed of your truck; this is almost double the payload capacity of the Nissan Frontier. 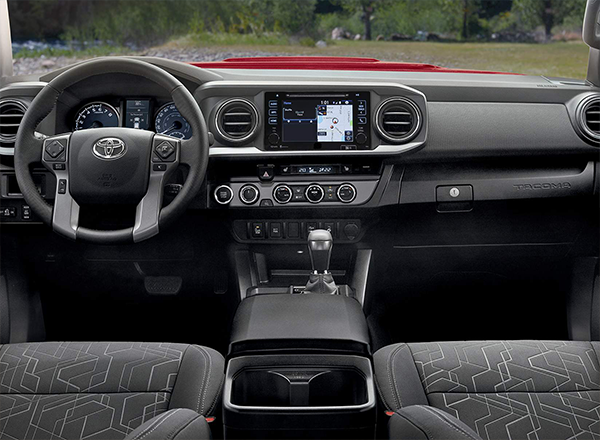 Standard features including Bluetooth, speed sensitive speakers, GoPro mount, backup camera, 6.1 inch touchscreen, multi-informational display and voice recognition make the 2017 Toyota Tacoma the top in terms of technology. This is especially true when you compare the GMC Canyon which doesn’t even feature Bluetooth capability. Standard safety features blow away the competition too. There are so many reasons that a small pickup truck will fit you and your families needs. The only way to truly find your best option is to jump inside and drive one. We have explained the amazing value retention and amazing features on the 2017 Toyota tacoma, and now we want to show you everything it has to offer you. Come in today to McPhillips Toyota and drive one!